Recently, we had the opportunity to speak with George Perkins, Head of Doing Stuff at Super Rare Games. 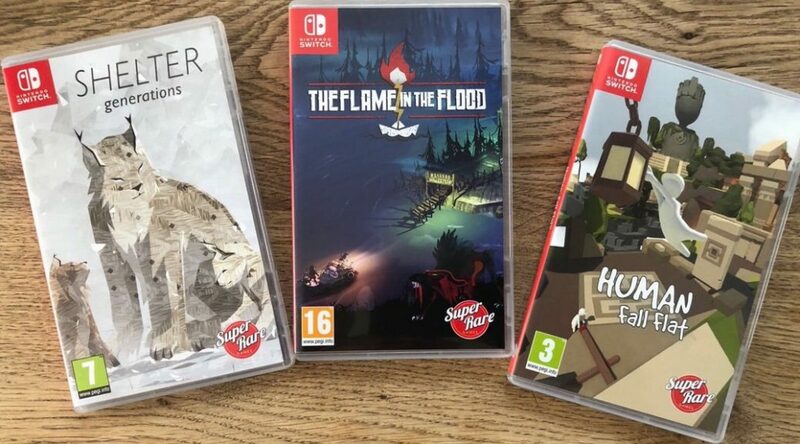 In case you’ve never heard of Super Rare Games, they are a company founded this year committed to publishing the “very best” Nintendo Switch indie games in physical form. Some of the titles they’ve published include Human: Fall Flat, The Flame in the Flood, and Shelter Generations. In this interview, we asked Perkins how he first started up Super Rare Games, the challenges and difficulties Super Rare Games faced, and what he thinks about the future of physical games. Have a look at all the questions and answers below. 1. What inspired you to form Super Rare Games (SRG), and why the name “Super Rare Games”? Perkins: We wanted to help support the independent developers on the Nintendo Switch! When we first began planning SRG, there was a lack of physical indie games happening on the platform,, our aim was to help change that. The name outlines what we want to create – Super Rare Games! The plan is to create a very clear and strong brand, we think we are almost there. 2. We read from another interview that you are 19 this year, which is pretty young for someone to run a video game publishing business! How was Super Rare Games funded, and how were things in the early days? Perkins: I have just turned 20, now. It is certainly quite young but the rest of the team are of a more normal age. It was funded from personal savings, credit cards and favors. I would still say we are in the early days, things are going very well. We recently hit 10,000 followers on twitter and this was a milestone we didn’t envision us hitting for quite some time. The fanbase is growing in the hundreds every week and we are really enjoying ourselves. 3. What are some of the challenges and difficulties you currently face running Super Rare Games? Perkins: Certainly the biggest challenge is the over saturation in the physical indie game market at the moment. Its much worse on the PlayStation 4 but we are starting to see it now on the Switch. More than ever, its important for us to have a very clear business model and keep signing the best games we can. 4. Do you usually reach out to indies (or the other way round) for a potential SRG release? Perkins: Happens both ways! We initially did a lot of outreach but now its more people coming to us. 5. How’s the reception like for SRG’s products so far? Perkins: Very very good. Everyone who has purchased a game from us seems very happy with the quality of the physical product (and the game inside). The best feeling is helping others find out about a new game that they end up loving. 6. What’s your favorite SRG release? 7. We’ve noticed that all of Super Rare Games’ releases come with the PEGI rating. Most video game collectors we’ve spoken to prefer collecting games with the ESRB rating, as it looks better than the PEGI rating, and they tend to hold more value. Do you have any future plans to cater to this group of collectors, and what do you think of this issue? Perkins: I wouldn’t say the ESRB rating is better looking, its more down to the fact that its used in North America (where the majority of gamers in the west are based). We will always display PEGI ratings on our games as we are based in the UK. Age ratings are very much a legal thing than a preference, unfortunately. 8. Earlier this week, Super Rare Games announced 9 new titles. Are there any more coming this year? Perkins: Those 9 games will be spread out over the next year or so, we have a few other big games in-between those. Perkins: Lots, we let them express themselves as much as they want to! One thing to note is our model is very much to take care of the whole operation. Many of our clients are busy people so we take care of it all, making sure to feedback to them regularly. 10. Where do you see SRG and the industry SRG is in 5 years from now? Perkins: I hope in 5 years time SRG will be a well known and loved brand which people love to collect. I hope that people will have our games on their shelves with pride. The industry, however, is an ever evolving place and we will see how we fit into that. We have a few very unique ideas that we hope will allow us adapt. 11. With the growth in digital sales, what are your thoughts on the future of physical games? Perkins: Sadly, I think one day the digital market will be the only way to play games. I feel streaming platforms will become the normal. I remain hopeful that physical releases will remain in some capacity! 12. How’s SRG’s relationship with Nintendo? Are they easy to work with? Perkins: We get on amazingly well with them! They love our work and are really appreciative of the fact we only release on their console!